CakeSpy Note: Too early for Christmas cookies? No such thing. And so even though it's before Thanksgiving, Christmas Cookie madness has already begun here! As much fun as it is to mess with recipes, sometimes you just can't mess with perfection. 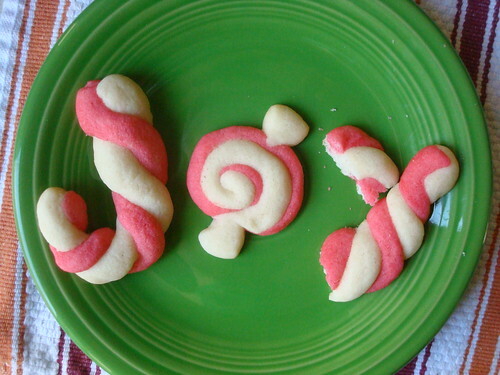 Such is the case with the candy cane cookies from Betty Crocker's Cooky Book , a recipe which I've been making for years. Aside from the fact that I take an all-butter rather than part shortening route, not once have I strayed from the original recipe, and not once have I been let down. They're easy to make, unmistakably festive for the holidays, and very delicious. Mix butter, sugar, egg, and flavorings thoroughly. Measure flour by dipping method or by sifting; mix flour and salt; stir into the wet mixture. Divide dough in half; blend red food coloring into one half. Roll a 4-inch strip from each color. For smooth, even strips, roll them back and forth on a lightly floured board. Place strips side by side, press lightly together and twist like rope. For best results, complete cookies one at a time--if all the dough of one color is shaped first, strips become too dry to twist. Place on ungreased baking sheet. Curve top down to form the handle of the candy cane. 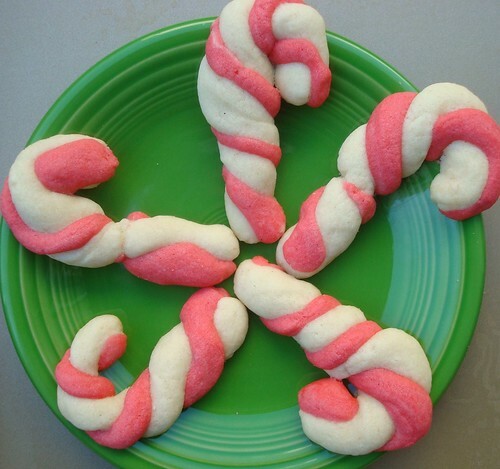 Note: If you want a variation, you can also place strips side by side and roll them into a spiral and affix small triangles of white dough on either end, to have the look of starlight mints like in the picture on the top of this post! Bake about 9 minutes, until lightly browned. While still warm, remove from baking sheet with spatula; if desired, sprinkle with a mixture of sugar and/or crushed candy canes.